Handy Backup performance is based on several technologies. Here we will concentrate on most important information. The backup in Handy Backup 8 is based on the principles of Client-Server technology. It’s enough to have just one server to manage all the client computers. In general, Users may not even know that their computer is under backup procedure. 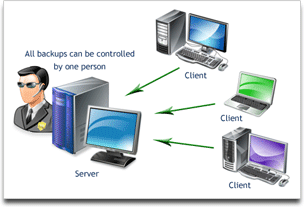 To perform a backup, it’s sufficient to set up all the server-side settings and then backup will be done on all of the client-side computers. Such efficiency is achieved by clever structural scheme of Handy Backup. Handy Backup 7 consists of several key components. Handy Backup for Workstations and Handy Backup Server Network are server-side software using the Management Panel as the interface, and both Workstation agent and Server Agent are client-side utilities called Network Agents. All the components together form a so-called “Backup Network”. The Workstation Agent provides access to data located on the remote computer and has a special interface to the objects (file system, databases, FTP, e-mail servers). All the objects can be presented in the “files and folders” form, so you can perform different operations such as copy, delete, view attributes, etc. When you do a backup, Handy Backup accesses the file system through a Workstation Agent. Workstation Agents allows backing up files and folders, Windows registry, disk images, generic databases via ODBC drivers, emails, cloud account data from services such as Google Drive, Amazon S3, Dropbox or OneDrive, as well as data from FTP, SFTP and FTPS servers (including websites). A Server Agent contains all functions and possibilities of Workstation Agents. In addition, it can save server-level data, for example, Microsoft SQL Server, MySQL, MariaDB, Oracle, PostgreSQL, DB2, Lotus Notes, VMware Workstation and Hyper-V virtual machines etc. Handy Backup for Workstations creates and starts tasks, does the monitoring, stores the logs, manages data setting, checks user authentication, and also is responsible for system protection. It has a number of unique parts, such as the settings manager (system setup) and access manager (checking user’s data). Handy Backup for Workstations can perform a wide range of operations according to client’s commands. Handy Backup for Workstations controls all the Workstation Agents. 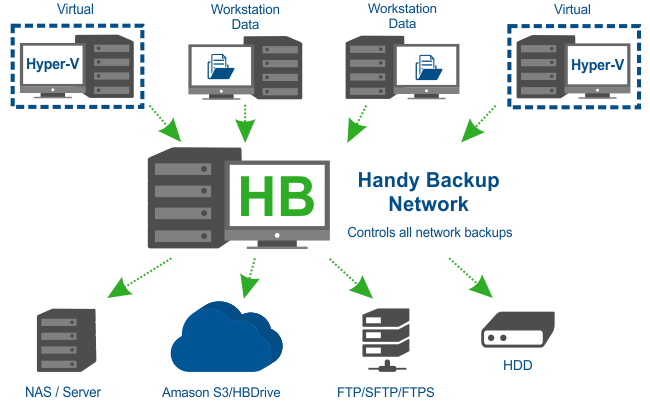 Handy Backup Server Network is more powerful software, because it has all the Handy Backup for Workstations features, but can manage not only Workstation Agents, but also Server Agents. Management Panel is a special program that can be used as an interface to the administrator’s computer (to simplify the configuration, monitoring or even perform data management). The Management Panel has the direct access to the files and folders where Workstation and Server Agents are running. The interaction of all parts of the system is good via the use of CORBA technology. CORBA is a special standard that allows different operating systems, services and components to communicate with each other using common share. Handy Backup editions for one computer, like Standard or Small Server, utilize the same client-server architecture as network-based editions. The Management Panel and a version of Network Agent somewhat simplified by connection methods (but not by functionality!) are both running on the same machine, using no network-based parts of protocols for data exchanging. For more information about the system, you can also read about client-server backup.